I have homemade fruit dip recipes, so grab an apple or angel food cake and get dipping with my favorite sweet dips. Creamy, caramel dips to butterscotch dips and everything in between. I also have savory dips and fondue too. In a mixing bowl, beat cream cheese until smooth. Add the sweetened condensed milk and mix well. Then add the frozen whipped topping and marshmallow creme. Mix until smooth. Serve chilled. In heavy saucepan, over low heat, melt chips with sweetened condensed milk and salt. Remove from heat; stir in vinegar and cinnamon. Serve warm with apples. Refrigerate leftovers. Tip: Can be served warm as an ice cream topping. Microwave: In 1-quart glass measure, combine milk, chips and salt. Cook on 100% power (high) for 3 to 3-1/2 minutes, stirring after 2 minutes. Stir in vinegar and cinnamon. 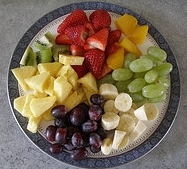 Another fruit dip recipe that is easy to make and delicious. In a mixing bowl, beat cream cheese and brown sugar until smooth. Add the sour cream, vanilla, lemon juice, milk and pudding mix, beating well after each addition. Cover and chill for at least 1 hour. Serve as a dip for fruit. Makes 3-1/2 cups. When ready to eat, sprinkle the top with sugar and place under the broiler until sugar is melted and caramelized. Add cream of coconut and milk to mixer bowl and mix on medium until smooth. Add pudding and sweetened condensed milk; mixing until thoroughly combined. Fold in heaping cup of toasted coconut and Cool Whip – mix until just combined. Add mixture to serving bowl and sprinkle with remaining coconut around the outside of the dip. Spread sweetened shredded or flaked coconut on a rimmed baking sheet and bake, stirring once or twice, until golden brown; approximately 5 to 10 minutes. If the coconut is sweetened, check and stir it more frequently. Beat together the cream cheese, powdered sugar and vanilla; set aside. Beat the heavy whipping cream until peaks form. Add this to the cream cheese mixture and mix well. Pour cream cheese filling into serving bowl. Smooth the top with a spatula, and refrigerate until firm, about 2 to 3 hours. Spread the cherry (strawberry, blueberry, etc) filling over the top, and refrigerate until serving. Easy to make isn't it? No hot kitchen. Makes a great pie - just use a graham cracker crust, and add your favorite fruit topping.